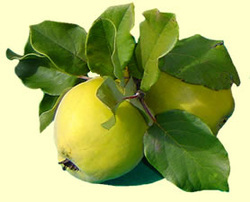 Quinces can be budded or grafted onto quince rootstocks with grafting being preferred. Quinces readily graft during summer and early autumn as well as grafting dormant scion. Quinces were once far more commonly grown and the fragrant fruit have many cooking uses. So far we have listed 29 varieties of quince as having once been grown in S.E. Quince cuttings should be started one winter and grafted the following winter. 1. [Goodmans1914] Goodman’s catalogue of 1914 The catalogue used American spelling for words such as color (colour) and flavor (flavour) and this has been retained. Goodman’s listing of 20 varieties of quince on the catalogue shows how quinces were once far more popular than today. 3. List of wax models kept at the Scienceworks Museum. At the Scienceworks Museum, 2 Booker St Spotswood, there only three models of quinces, however this may aid the identification of one of the heritage varieties that is "Whereabouts unknown ", a quince called "Chinese". The collection can be viewed on weekdays between 10 am and 4:30pm, by previous arrangement on 03 93924819 and ask for Liza Dale. 4. [Burnley] List of fruiting plants growing at the Royal Horticultural Gardens, Richmond Park, Burnley, in 1896. Thanks to the State Library of Victoria for allowing us to use information contained in this list. 5. Quince varieties in Australia by Dr Jill Campbell. 6. [Levian] Undated Catalogue of Levian and Son, Seedmen and Nurserymen 183-185 Elizabeth St, Melbourne. 7. [Grays] 1907 Catalogue of W G Gray's Nursery, Diamond Creek. 8. [Nobelius31] 1931 Catalogue of C. A. Nobelius & Sons, Gembrook Nurseries, Emerald.